Investors have gotten used to bad news, but layoffs topping 600,000 a month still made for a volatile day on Wall Street. Stocks soared, sank and then clawed their way back to a mixed close Friday after the Labor Department released its February jobs report. Employers cut 651,000 jobs last month, and the unemployment rate jumped to 8.1 percent. The government also revised its December and January job loss figures up to 681,000 and 655,000, respectively. Many market participants had been bracing for even worse readings. "We know it's going to be really bad and we're looking for an unemployment rate that peaks out around 9.5 percent next spring," David Wyss, chief economist at Standard & Poor's, told CBS News. Still, the major indexes remain down sharply for the week and near 12-year lows. The Dow Jones industrial average is down 6.2 percent for the week, and the Standard & Poor's 500 index is down 7 percent. Both have fallen more than 24 percent since the start of 2009. And many market watchers say there's no reason stocks can't slide further. "My sense is we haven't discounted all the negatives out there as of yet," said Rob Lutts, president of Cabot Money Management. Big institutional investors are still largely waiting for positive signs from the economy before making any major commitments. As a result, the market is largely being driven by "short" traders, who sell borrowed stock and then buy it back later in hopes that the price will decline in the meantime. That makes for a choppy, unpredictable market. "The shorts are having a complete field day in this environment," said Kent Engelke, managing director at Capital Securities Management in Glen Allen, Va. "Right now you have everybody so fearful, and these shorts are controlling the market." 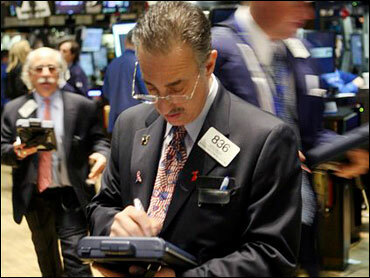 According to preliminary calculations, the Dow rose 32.50, or 0.5 percent, to 6,626.94. The S&P 500 index rose 0.83, or 0.12 percent, to 683.38, while the Nasdaq composite index fell 5.74, or 0.44 percent, to 1,293.85. The Nasdaq is down 6.1 percent for the week, and at a six-year low. Three stocks fell for every two that rose on the New York Stock Exchange. Volume came to 1.77 billion shares. With uncertainty about the economy and financial system keeping the bulk of investors on the sidelines, even small advances have been difficult to maintain. "When you get this precipitous of a fall, you are always due for some sort of rally, but a rally will be unsustainable," said Jeff Buetow, senior portfolio manager at Portfolio Management Consultants. And the market, analysts say, needs more clarity about the troubled financial sector before buyers come back into the market with any force. Until then, Engelke said, a sustainable advance is impossible. "You can't have a healthy economy without a healthy banking system," he said. Banks continued to slash their dividends in anticipation of more loan losses this year. Wells Fargo & Co. on Friday cut its dividend to 5 cents a share from 35 cents, following last week's move by JPMorgan Chase & Co. to reduce its dividend to 5 cents as well. Citigroup and Bank of America Corp. had already slashed their quarterly dividends to a penny per share. Wells Fargo shares rebounded Friday by 18 cents, or 2.2 percent, to $8.30. Citigroup, which fell below $1 a share for the first time Thursday, rebounded by a penny to close at $1.03. But most other financial stocks slumped. JPMorgan dropped 67 cents, or 4 percent, to $15.93, Bank of America slipped 3 cents to $3.14, Goldman Sachs Group Inc. fell $6.07, or 7.4 percent, to $75.65 and Morgan Stanley fell 80 cents, or 4.5 percent, to $17.18. GM shares continued their freefall as speculation about the automaker's future swirled. On Friday, members of the Obama administration's auto task force met again with the company's stakeholders. GM shares dropped 41 cents, or 22 percent, to $1.45. Bond prices were mixed. The yield on the benchmark 10-year Treasury note rose to 2.88 percent from 2.81 percent late Thursday. The yield on the three-month T-bill fell was flat at 0.20 percent. Gold prices rose as the dollar traded mixed against other major currencies. Light, sweet crude rose $1.91 to settle at $45.52 a barrel on the New York Mercantile Exchange. Overseas, Britain's FTSE 100 rose 0.02 percent, Germany's DAX index fell 0.79 percent, and France's CAC-40 fell 1.37 percent. Earlier, Japan's Nikkei stock average fell 3.50 percent, and Hong Kong's Hang Seng index fell 2.37 percent.